You may read about or hear of various individuals or manufacturers being held up as the inventors of the defibrillator and therefore we thought that presenting an objective history might bring some clarity to the matter. The story of the defibrillator goes back over 100 years! Defibrillators were first demonstrated in 1899 by Jean-Louis Prévost and Frédéric Batelli, two physiologists from University of Geneva, Switzerland. They discovered that small electrical shocks could induce ventricular fibrillation in dogs, and that larger charges would reverse the condition. The external defibrillator as known today was invented by Electrical Engineer William Kouwenhoven in 1930. William studied the relation between the electric shocks and its effects on human heart when he was a student at Johns Hopkins University School of Engineering. Kouwenhoven’s observation was picked up by a pioneering cardiac surgeon, Claude Beck, at the University Hospitals of Cleveland. He began delivering AC directly to the exposed hearts of animals he had put into ventricular fibrillation. Beck might have continued methodically with his animal experiments, except that in 1947 a 14-year-old patient’s heart stopped during surgery. Out of desperation, Beck ordered that his research unit be brought up from the hospital’s basement. This simple defibrillator consisted of a transformer to isolate the patient from the 110-volt ac wall supply, a variable resistor to limit the current to a heart-safe value, and two metal tablespoons with wooden handles to deliver the jolt to the exposed heart. The first shock failed, so Beck administered a second. That brought the patient back to life, and the event made national news. But because so little was known about why the technique worked or how to improve it, these crude ac systems persisted for several years. Recipients of closed-chest ac defibrillation tended to suffer unpleasant side effects from the large steady currents, including broken ribs and damage to the heart muscle—if they were saved at all. Unknown to Beck and his colleagues in America, investigators in Europe and Russia were far ahead of them in animal research and were beginning to use a single pulse, or dc, defibrillation. Decades later, one of Kouwenhoven’s graduate students, Lina Schtern, moved to the Soviet Union and continued to refine the technique—that is, until she received a death sentence during a crackdown on intellectuals under Joseph Stalin. She was eventually pardoned by the dictator himself, who (according to accepted rumour) believed that she could bring people back from the dead. In 1933, Dr. Albert Hyman, heart specialist at the Beth Davis Hospital of New York City and C. Henry Hyman, an electrical engineer, looking for an alternative to injecting powerful drugs directly into the heart, came up with an invention that used an electrical shock in place of drug injection. This invention was called the Hyman Otor where a hollow needle is used to pass an insulated wire to the heart area to deliver the electrical shock. The hollow steel needle acted as one end of the circuit and the tip of the insulated wire the other end. This never caught on and there was very little clinical data to support that this actually achieved anything. A major breakthrough was the introduction of portable defibrillators used out of hospital in the 1950’s. 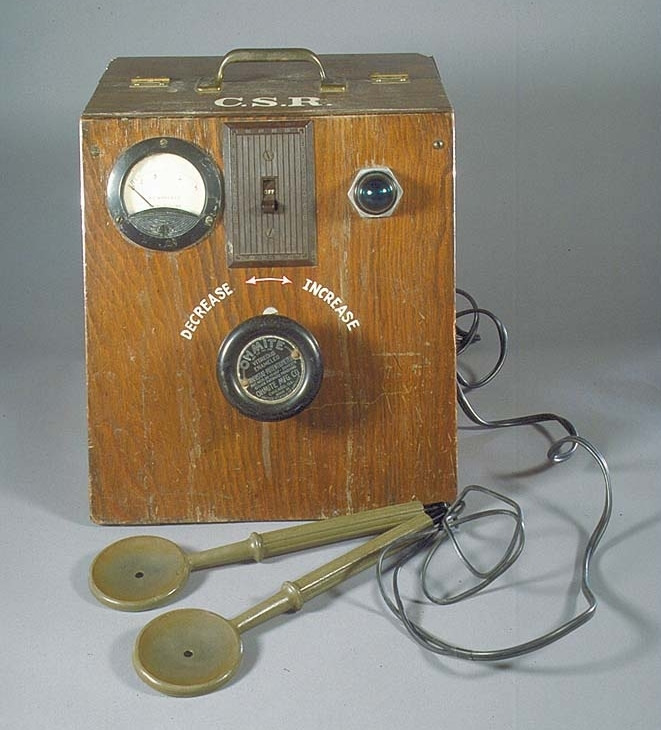 Pioneered in the old Soviet Union and satellite countries, the Czechoslovakia Gurvich Peleška's Prema defibrillator was designed to be more portable than original models used elsewhere in the world. In the Soviet Union, a portable version of Gurvich's defibrillator, model DPA-3, was first reported in 1959. However, In the west the development of the portable defibrillator is accredited to Prof. Frank Pantridge in Belfast, who in the early 1960s developed the first truly portable device, weighing over 70Kg and needing its own vehicle to transport it! By today, portable defibrillators are among the many very important tools carried by ambulances and also used in public settings by lay-persons. They are the only provable way to resuscitate a person who has suffered a cardiac arrest unwitnessed by Emergency Medical Service (EMS) who are still in persistent ventricular fibrillation or ventricular tachycardia prior to the arrival of an ambulance. Gradual improvements in the design of defibrillators, partly based on the work developing implanted versions, have led to the wide availability of Automated External Defibrillators. These devices can analyse the heart rhythm by themselves, diagnose the shockable rhythms, and charge to treat. This means that no clinical skill is required in their use, allowing lay people to respond to emergencies effectively. There are many types of devices, and at CHT we look at these, and grade them as to their suitability for community use (as defined by the untrained user).